The vertical garden wall at LA Plaza de Cultura y Artes, LAPCA, near La Placita Olvera in downtown LA, is a place I visit frequently on the way to the office. In fact, I stop by so often that the on-site security guards eye me nervously some mornings, wondering, I’m sure, what the hell I’m looking at. 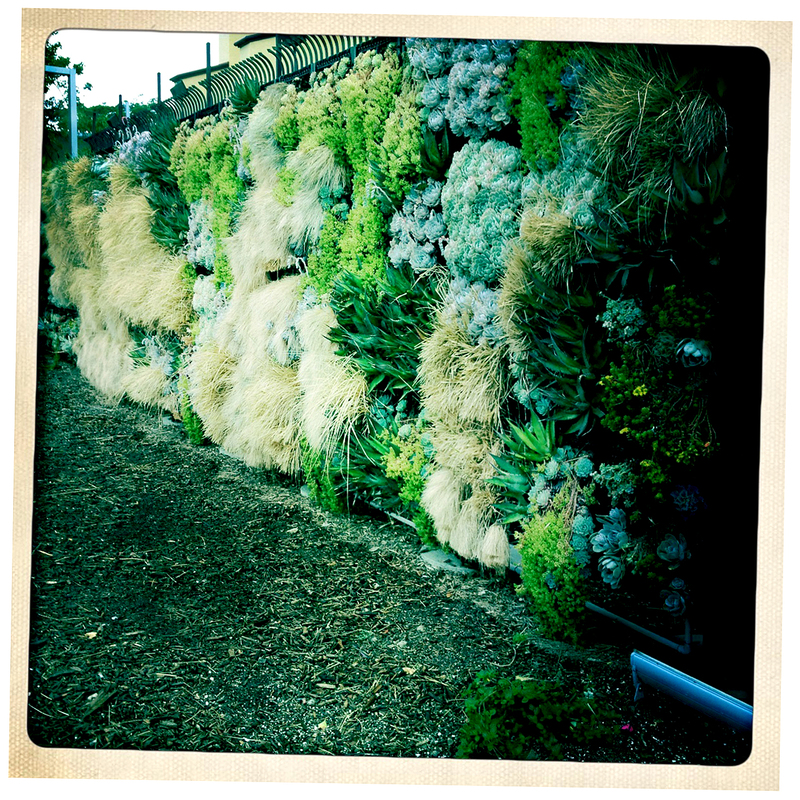 I don’t bother to tell them I love tracking how the wall’s succulents and grasses have changed — waxed and waned — since I first posted about them in August last year (read here). 10 months along and some spots are now threadbare; plant material that filled those spaces has dried and died, exposing the wall’s plastic grid support and planting pockets. Vertical gardens are mysterious sometimes, keeping their structural secrets well-hidden, so I quite enjoy this behind-the-scenes peek. Approached from the side, the wall appears lushly full — of color, texture, pattern and movement. It’s a sight that never fails to give me a boost, no matter how hazy the skies are and how much work awaits. 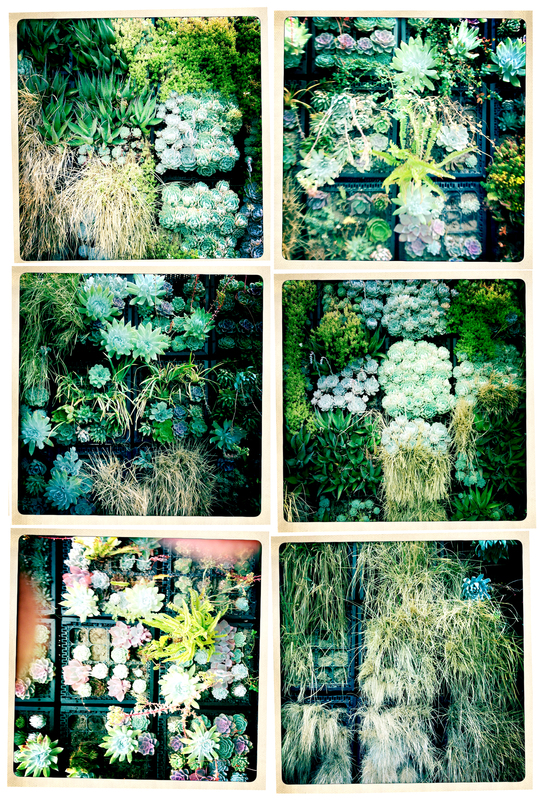 Thanks, John, it’s fun to see succulent love spreading nationwide! I recently stumbled across your blog and after seeing what a succulent enthusiast you are, am hoping you might be able to recommend a good potting soil. My husband and I just bought our first home two years ago (a Wood Street fixer upper). We are in the process of our front yard landscape and I would love to add some potted succulents to the mix. Any tips would be super helpful! Hi, Chris, thanks for reading and commenting. For potting succulents I recommend using a potting soil mix that contains material that aids in drainage. Called variable cactus mix, or palm mix, you can find it readily at big box hardware stores. Parkview Nursery on Magnolia has what they call Cactus Mix soil and I’ve used that quite successfully. Congrats on beginning your front yard project; very exciting. If you don’t mind, I’d like to take a peek at what you’ve got going on. I’ll send you a message on my personal email account. I’d LOVE any ideas you might be willing to share. So far we have just cleared out the front yard and rototilled the area so we really are a blank slate. But, because we live in the historic district, the city has quite a few “preferences” for our project. Love to email you the pictures of the space and the plants I’ve recently purchased. You have a great eye and would love to connect more with you! Sounds great, I’ve emailed you separately. Thanks! Hey Chris!! Watch out! You will find a wonderful world of plants with Reuben… And so many places around SoCal that he finds his way to. Why, you can go places and not wander from your home. Except to find some of these spots for yourself. Ones that you know you’ll like. And so much information and love of the subject. Since I met him it’s been so much fun following his blog. And he’s just a nice guy,too. Enjoy!! Too cute, Vickie! I’m looking forward to jumping into the gardening and the like and cant wait to learn more! Thanks for the tip, I love seeing what other succulent lovers are up to!